I would consider this article a beginners guide to mountain biking. These are the top 5 question people have when getting into the hobby or sport of mountain biking. 2 2. What type of riding do you want to do? 3 3. 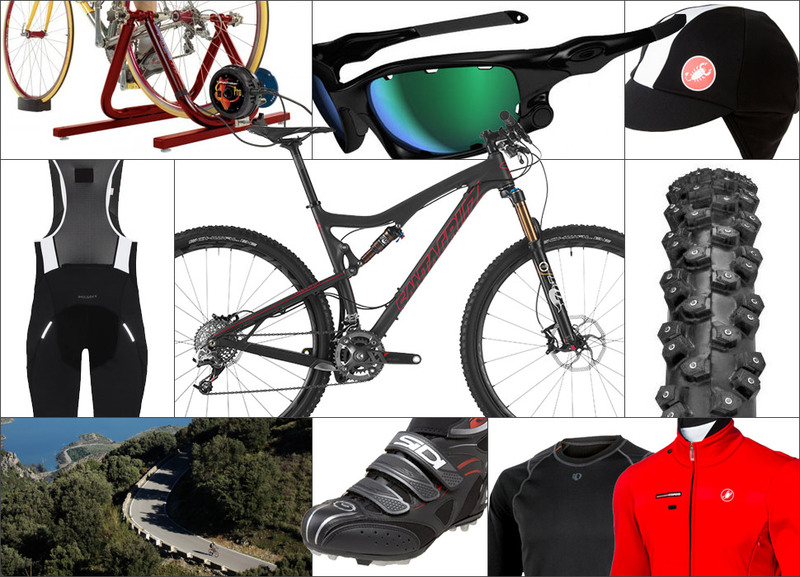 What accessories do I need for mountain biking? 4 4. What size and brand should you get? 5 5. Whats the best type of bike to get: aluminium, steel, titanium, carbon? First things first, establish your budget! How much are you willing to spend on your new hobby? 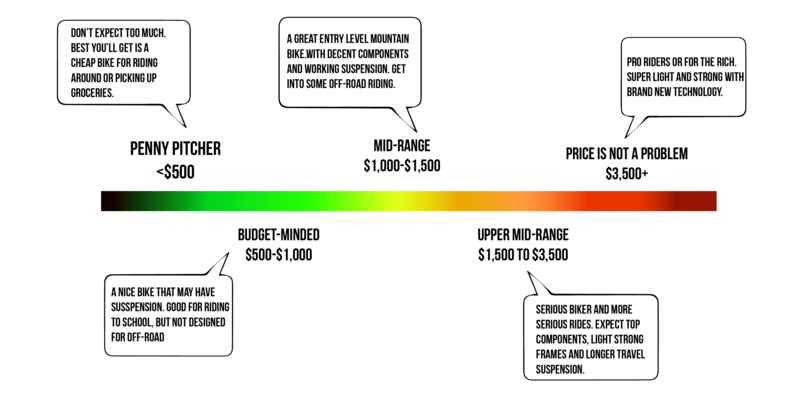 Mountain biking can be expensive and it adds up. With that being said you don’t have to spend too much money to have a fun time riding. I created 5 different categories that breaks down how much people are willing to spend. First there’s the Penny Pitcher who’s going to spend around $500 or less. You’ll get a pretty cheap bike and don’t expect too much. While this category can have some strict limitations you can typically find some decent bikes around this price range. Typically, in this category you want to stick with an entry-level hardtail bike. Yet you could find some great mid-level used hardtail bikes, either from a previous model year leftover, online or at yards sales. Try and avoid full suspension bikes, because if they are new they will have low quality “store” brand and if old they will most likely be beat up or end up costing you more in repairs. Try checking out Craigslist or even Yard Sales you never know what you could find at a good price. Secondly there the Budget-Minded individuals, these folks are willing to spend between $500 to $1,000. In this price range you can get a very nice hardtail or even perhaps a 29er (which is a 29 inch wheel). You can look into getting an entry level full suspension bike as well. Budget-Minded individuals most definitely want to look for some great deals on rentals or even Craigslist. Third category is the Mid-Range individuals who can spend upwards of $1,000 to $1,500. Once you hit over $1,00 your options open up greatly. You can look into clearance and model year close-out choices that have great bikes. There’s a number of full suspension bikes and nice hardtail in this range. Typically these bikes in this price range will have the same frames as the pricer models but with cheaper components. Choosing one of these bikes can set you up for an upgrade but with better parts. Now it’s the Upper Mid-Range category, with a price range of $1,500 to $3,500. In this price range you can find a bike that will last you for years. This category is for the more serious riders. You can find race ready hardtail and decent mountain or trail full suspense model. You can expect to find top components, light strong frae and long travel suspension. Lastly, are the folks that don’t worry about price, these are most likely the pro-riders, lotto winners are just plain rich people. They can spend money on a bike with a price range of $3,500 and up. Of course these folks don’t have to worry about price and more concern about getting a bike that is exactly what matches your riding style. You’ll most likely find a bike in this range that is super light and strong, with brand new technology. 2. What type of riding do you want to do? What you want to figure out next, is what kind of riding you want to do. Your pick may even change how much your going to spend on your hobby. Below I categorized the 4 different types of riding. All-mountain is just that, a bike intended to be ridden both up and down the mountain. Slower on flat, open courses than a XC, but more maneuverable. Trail bikes usually have lower gearing than XC bikes, again making them slower on open courses. But they’re meant for more technically difficult riding where that speed won’t be useful anyhow. Downhill riding is gravity fed so no going back up hill. Bikers are driven to the top of a trail and they ride straight down. 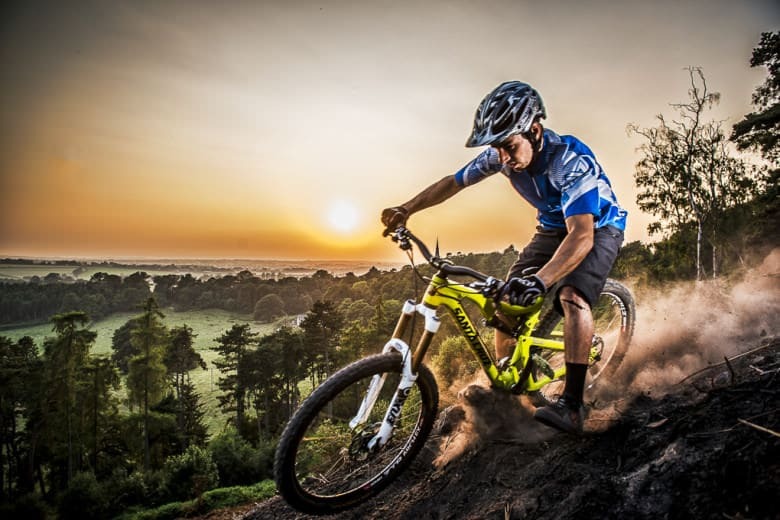 Downhill riding is more for the adrenaline junkie, they travel at high speeds that has many big drops and obstacles to avoid. Downhill bikes has more of a sloping top tube design that is designed for downhill riding only. It also has a more chunkier types for grips, big rotors in the disc brakes for a powerful stopping power. The bike also has fewer gears since they are not riding uphill. Downhill bikers should wear much more protection, like a full face helmet, eye googles, chest and back plates. Free style riding focus on balance and taking on big drops. These bikes are similar to a downhill bike but is less emphasis on weight and more on strength. The bikes frame is designed more flexible so they can maneuverability over and around small objects. There two different main types of free style riding, dirt jumping and slope style. Dirt Jumping is usually when riding at dirt park that has many different level jumps with high steep. It involves riding bikes over mounds of dirt and becoming airborne. Riders are more focussed on riding at high speeds on jumps and trying out plenty of tricks. The bikes that are involved are usually BMX and free ride bikes, with 4 to 6 inches of suspension without a rear suspension and up to nine gears. Slope style is another popular type of riding. Its much like Dirt Jump but on a much larger scale. It’s typically a course that is curved into a hill with drops, jumps, double wall rides and many other features. 3. What accessories do I need for mountain biking? Accessories are another expense when it comes to mountain biking. Im going to go over some core gear that every mountain should not be without. Also Im providing some of my top core bike repair items as well as a list of my top personal items to take while riding. 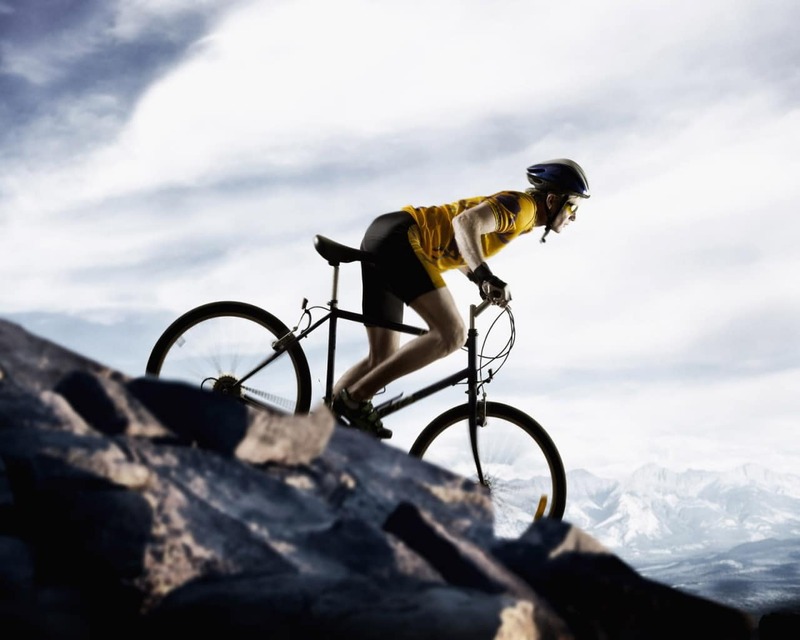 Click Here to read about our Top 10 Mountain Bike Accessories! This is a no brainer, ever biker should always have a helmet. It’s so important to keep yourself protective when biking. It a dangerous sport to begin with especially when it comes to ride down hill at top speeds, avoiding obstacles or even jumping. Wearing a helmet can be very beneficially in avoiding a serious head injury. When riding hands can take a big beating, especially when you crash. Your hands are the first to hit the ground. Wearing gloves can protect you from the getting seriously injured and avoiding blister, which are highly common among bikers. Ridding shorts are much better then regular shorts because they have built in padding to make it much more comfortable when riding. After a while your rear end can begin to hurt and riding shorts can keep it to a minimum. Riding shoes an important accessory because they are built more durable, comfortable and have a stiff sole for a better pedaling efficiency, rather than regular cycling shoes. When picking the right shoes it all depends on the type of riding your doing. The shoe is based on the type of pedal you need for your ride. Protective eyewear is highly important for not only keeping the sun out of your eyes but to protect your eyes from different conditions. Such as rain, dirt or mud and even the wind. When riding at a fast pace things can get thrown into your eyes. Riding glasses come in many different styles and prices that can best fit the rider. A hydration pack is great when riding, because you have quick access to your water or other liquids, hands free. It makes for an easier bike ride, since bikers don’t have to stop and reach for their water bottle. The hydration pack may not be an essential; but it is a great accessory to have because, it can help reduce stop time and add more time for you biking. A reflective cycling vest is important when riding at night or on a busy road/highway. Typically used when with Cross Country riding, because these riders are more likely to share the ride with cars. 4. What size and brand should you get? 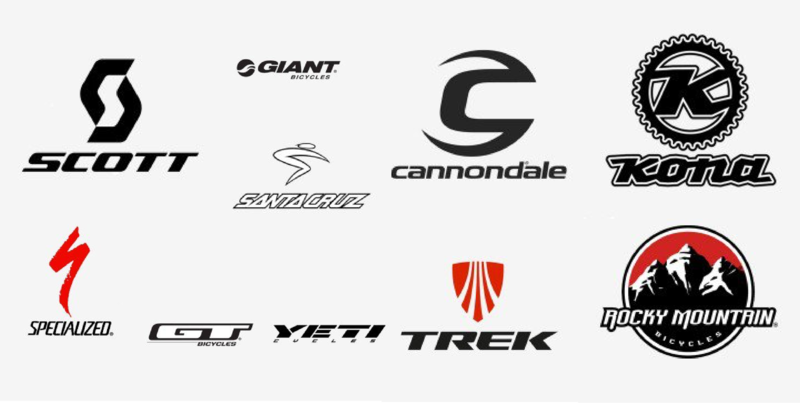 Theres no specific brand to get when picking a mountain bike, it all depends on your personal preference. Some brands may be more expensive then other but have good quality parts. While other brands may be more loved because of what they offer.Below I have the top brands of bikers. 5. Whats the best type of bike to get: aluminium, steel, titanium, carbon? Being a beginner I’m sure your overwhelmed with all this new information.To make things even harder on you, now you have to pick what kind of metal/material you want for your bike. I’m going to make it as simple as possible going over the different metal/material you should get for your specific riding experience. The most common type of bike frames is steel. It is a good strong and long lasting bike. There two types of steel the carbon (high-tensile) steel and the chromoly (chrome molybdenum) steel. The difference between the two is that the chromoly is considered the big brother of the carbon, and is built to be more high-tech and lighter. The less expensive of the metals/materials it is also much more widely used on bikes today. Great bike for riding or chiming on tough and rough terrain. Pretty costly but, is considered more of a durable material. Found on more high-end road or XC , cross country mountain bikes. The bikes flex is great that many high-end bikes use the metal itself as a shock absorber. Carbon Fiber is becoming an increasingly popular frame material and an expensive one as well. If your in the Upper mid-range that you can look into a carbon fiber bike. The bike is heavier than a modern frame, but its general riding qualities are much nicer then any bike. There many factors can you should consider while picking out your bike. For example how long are you going to keep your bike, how much do you weight and how much money are you willing to pay? If your going to have your bike for a while, steel and aluminum are both great choices. Steel can take much more stress over the long run than aluminum. If you live in a wet climate, aluminum is a better choice. I you live in a dry climate steel will do much better for you. If you are over 170 pounds you want to pick a metal/material that has a higher strength. Steel and titanium are better because they can flex more without breaking. Titanium and carbon fiber are still pretty expensive, and the price of aluminum is coming down in price. Steel is the much cheaper of all the bikes. Thank you for enlightening me. Sometimes i don’t know what to consider when am buying mountain bikes for me and my family. I like the tips that you have shared here. 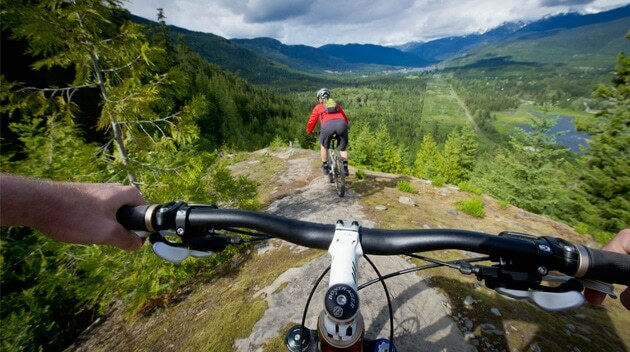 I am a mountain bike lover and it’s the most enjoyable thing that i do during my free time. It was really helpful. Thank you so much.